Our members are what makes IABC/BC a great place to network, volunteer, and grow your career. As part of Member Month, we’re sharing member stories from across our chapter. 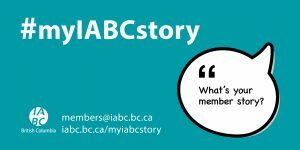 The #myIABCstory campaign began two years ago, and we’re excited to revive the content and spirit of the launch to further highlight the range of industries, experience levels, and careers of you, our members. Watch out for #myIABCstory posts on the IABC/BC social media channels, and join in on the conversation. What makes an IABC/BC member story? They also highlight that there’s no one-size-fits-all. These stories are from an array of members ranging from BC newcomers, to students, to senior communicators, yet each speaks to the core elements of the IABC member experience. Do you have an IABC/BC story to tell? If you’re an IABC/BC member, contact members@iabc.bc.ca. We’d love to work with you on creating your #myIABCstory.